It has been a bizarre winter here in Vermont. Classic, picture-perfect snow storms, with lots of great powder for our famous ski slopes, have been followed by sleet, freezing rain, and March-like weather with thawing and balmy days. And then it snows all over again. And then it drops far below zero. So this means that we have been making sure we ski or snow shoe while the opportunity exists; and, we have been reading a lot of good fiction by our respective wood stoves and fireplaces to keep warm. As Mark Twain said, “If you don’t like the weather in New England, just wait five minutes.” Good thing it’s always the perfect weather for reading. Two recommended books from our most recent reading are reviewed below. And, because we have been reading so many good books lately, and we never know what you all are in the mood to read, we put in a bonus pick or two. 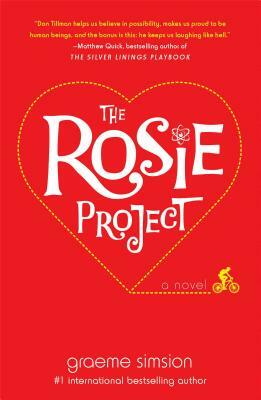 The Rosie Project by Graeme Simsion (2013) – Just in time for Valentine’s Day comes this review for Simsion’s international bestsellerThe Rosie Project. I loved this crisply smart romantic comedy that takes you into the world of socially challenged Don Tillman, a 39-year-old geneticist looking for love in all of the wrong ways. It doesn’t help that he has designed a 16-page questionnaire to help him find the perfect partner, that he “speed date” eliminates those who answer incorrectly, and that probably no one would meet his criteria. When he meets Rosie, a sharp, beautiful “barmaid” 10 years his junior, he doesn’t know quite what to make of how he feels and of the ensuing series of unplanned, wacky events. This is sort of a “When Harry Met Sally” story with a Curious Incident of the Dog in the Nighttime narrator. Throw in a DNA matching side plot and you have yourself a love story with a little science on the side. Radiance of Tomorrow by Ishmael Beah (2014) – This is Mr. Beah’s first novel, but not his first published work. His acclaimed memoir A Long Way Gone, about his life as a child soldier in Sierra Leone, soared to the top of bestseller lists, becoming an instant classic that “everyone in the world should read” (The Washington Post). So with that build up, our thoughts on his fiction. Yes, Radiance of Tomorrow is set in Africa. And yes, the other Lisa and I seem to pick books with this setting often. But unlike many novels with African settings that focus on life during a civil war or leading up to a war, this novel looks at what happens AFTER a civil war, with insight and grace.